Good protection, light, well vented, adjustable fit. The Millet Expert checks all the boxes for a skimo helmet. It also features a magnetic chin-strap closure and a cool new look. The Expert helmet can be used for racing, alpine climbing, and even sport routes. Four headlamp hooks make it viable for dawn patrols and a plethora of side vents make it cool enough for moving fast. Smartly the front of the shell is not vented so googles won’t fog due to sweat vapor passing through a hole. 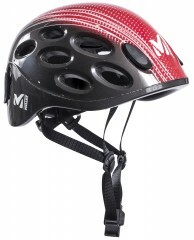 The Millet Expert Helmet is a solid option for lightweight ski mountaineering. Micrometric dial lets you adjust the fit based on your headwear that day. Expanded polystyrene core disperses energy from top or side impacts. Fully adjustable chinstrap has a magnetic closure for fast operation. Four retainer clips can hold a headlamp or pair of ski goggles. Twelve oval vents line the sides for optimum cooling. Are those two black plugs on the front removable for venting or is that the thing that connects the helmet straps to the helmet? Hey John, you got it, they're the anchors for the helmet straps. Theoretically you could remove them for venting but your helmet probably wouldn't stay on for very long without some kind of duct tape.